Burmese Prawns Burma – what an amazing country. Lucy and her sister Hannah traveled around Burma earlier this year for an action-packed adventure from the bustling city of Yangon to the idyllic Inle lake in the heartland of the Shan state. Still feels untouched by westerners, and just so incredibly beautiful – Bagan is probably one of the most wonderful places I have ever been with 1000’s of ancient temples, one of which we climbed at 4 am to watch a mesmerizing sunrise whist hot air balloons floated by– just mind-blowing. Defiantly a country to visit, especially before it changes. We had been warned about Burmese food before heading out – terrible we had been told. Well we were in for a good surprise, we ate so well, so many delicious and new concoctions. The best restaurant we ate at was in Yangon called Port Atomony owned by a very talented guy called Kevin, how I would imagine Tart to be if we moved to Burma – if you are planning a trip then it’s a definite recommendation. We started the trip by the coast on Nwe Saung beach – white sands and warm sea, pretty idyllic. There was a fantastic local restaurant which we got to by taking a tuk tuk down a winding road surrounded by palm trees which was so good that we ended up going to about 3 times – and every time had this sensational prawn dish. The owner was a super cool Burmese guy who would sit and tell us stories into the wee hours. On the last day we did a swap for the prawn dish for one of our Tart classics. The only problem is we cant read his writing! So this is an adaption of his punchy fresh Burmese prawn dish. Think along the lines of a pad thai (the fish sauce, noodles and peanuts give it that vibe) then with the added spice mix and crunchy veg take it to a whole new place. 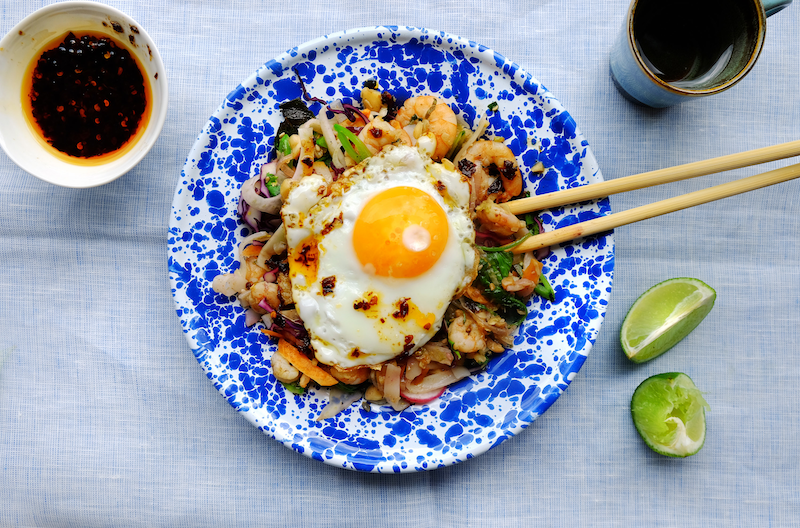 We have added a fried egg to make this into a fun brunch dish, but easily can be made without for lunch or dinner – and drizzle with some spicy chilli oil!